You’re on a well-deserved vacation in the Caribbean, and you’re trying to take an early morning stroll along the beach with your significant other. We’ve all been there, and it’s a great experience. That is until the swarms of mosquitoes show up and the $13 repellent you bought isn’t cutting it. You end up with a bunch of mosquito bites on your legs, arms and face. You don’t have to be stuck scratching and itching all week and end up getting scars from mosquito bites. In this article, I'll be going over the simple (and cheap) solutions to getting rid of mosquito bites. What exactly are mosquito bites? So how do I get rid of mosquito bites? Mosquito bites are allergic reactions to the mosquito’s saliva (anticoagulant) used to prevent a human’s blood from clotting. Most of the world is allergic to mosquitos and their saliva, which is why mosquito bites exist. The Smithsonian Science Education Center explains it nicely. When our bodies are confronted with an allergen, they produce a histamine, an inflammatory protein. Your body sends red and white blood cells to fight the potential infection, which results in a bit of swelling and a slight itch. If you aren’t one of the lucky few who is immune to mosquito bites, then keep reading. If you want to get rid of mosquito bites, you have a couple of options. You can either prevent them from biting you in the first place or treat the mosquito bite with an antihistamine. For this guide, I'll provide detailed ways you can go about both routes. Get rid of mosquito bites by preventing them in the first place. Your first option when it comes to getting rid of mosquito bites has to do with preventing them from occurring in the first place. There are many mosquito repellents on the market, but the majority will usually have one of the following five main active ingredients. Some of the ingredients are made in a lab while others are produced using a combination of plants, bacteria, and certain minerals. DEET: Originally developed for the Army in 1946 to protect soldiers against insects, DEET tries to ‘hide’ or ‘mask’ your body from the view of bugs, so they don’t bother you. DEET tends create skin irritations after prolonged exposure, but generally, DEET is considered to be safe. Picaridin: Like DEET, Picaridin aids in repelling mosquitoes by reducing their ability to see or sense you. Picaridin was originally developed in the 1980’s as a synthetic compound but has only recently (2005) been available for use in the United States. IR3535: IR3535 is a "biopesticide repellent" which means that it is derived from naturally occurring materials. Products with IR3535 have been found to have comparable mosquito repelling results when compared to synthetic ingredients such as DEET or Picaridin. Lemon Eucalyptus Oil: Here is another biopesticide that is extracted from the stem and leaves of a eucalyptus plant. When used, Lemon Eucalyptus oil has an active repelling period of 6-7 hours. Citronella Oil: One more biopesticide, Citronella oil is liquid extracted from the leaves and stems of lemongrass. This stuff is often found in candle form to keep mosquitos away. It’s level of effectiveness varies. Mosquitoes find you through your natural producing odors. Mosquito repellents help mask those odors through with chemical combinations. If you use a repellent with one of the above ingredients, understand that they will help but aren’t 100% efficient. There’s a good chance you’re still going to get bitten. The EPA publishes a table of all the registered mosquito repellents and their effectiveness. It's a little hard to navigate, so I listed the highlights below. *Note that the above numbers are approximations. You can find the full EPA published information here. The effectiveness of repellents depends on how much active ingredient is in your repellent (e.g., 30% DEET tends to perform better than 20% DEET). Your results may vary. Think of repellents as your defense against mosquitoes. They’re great for traveling and hiking but won't keep the buggers away for long. Something you probably didn't think of was buying a bat house to get rid of your mosquito problems. One bat can kill up to 1,000 mosquitos per night and a single bat house can attract up to 25 bats. Check out the below video to get a bat house set up at your house. One alternative to bats and repellents are fans. Fans are cheap, effective, and natural solution to get rid of mosquitoes. You'll need mesh, a high flow fan, some string, and an oil lamp to attract the mosquitoes. The below video illustrates exactly how to go about setting up one of these fans. It’s summer, and you decide to go on a nice run during the summer months. Of course, you opt for some mosquito repellent at the store to help with the bugs. You apply the solution and go on your way. Fast forward to after your run, and you’re now covered in bites. This type of scenario is quite common with runners and anyone who likes to be outside. So if you get a mosquito bite is there anything you can do to treat it? When you come into contact with something that you are allergic too (in this case the mosquito’s saliva) your body produces a histamine. The presence of an histamine results in your red blood vessels to swell so that your white blood cells can identify the source of your problem. This swelling in the cause your mouth, eyes, and body to react. You might get a stuffy nose, hives, itchy eyes, etc. The job of an antihistamine is to stop histamines from wreaking havoc on your body and suppress allergy symptoms. Delilah Warrick, M.D encourages patients to take oral antihistamines a couple of hours before going into mosquito infested areas. Oral antihistamines vs. topical (skin treated) antihistamines, which is better for mosquito bites? If you’re thinking about antihistamines, you have two options. You can either take a topical ointment (e.g., cream that you’d apply to your skin) or something by mouth that you’d swallow. Dr. Warrick recommends oral antihistamines (Allegra, Claritin, Benedryl, etc. ), but I know some people who swear by Vick’s Vapor Rub. There is no one magic bullet. Also be mindful of the side effects because they do exist! To help you out, I’ve listed all the ways people have been able to treat and relieve mosquito bite itches. From banana peels to hot spoons, they’re all in here. I tried to organize them by effectiveness, but your results may vary. If antihistamines aren’t your thing, consider corticosteroids as an alternative. As an alternative to antihistamines, hydrocortisone cream has been the go-to recommendation by many physicians to get rid of itchy mosquito bites. While antihistamines reduce the presence of histamines in your body, the corticosteroids treat the inflation on the skin and reduce the itching sensation. Both are answers to the same problem, and it’s up to you to figure out what works best for your particular situation. Please note: Long-term use as well as application of corticosteroids across a wide body area may lead to unwanted side effects, especially in children. Click here to learn more. Despite the fact that many doctors recommend antihistamines and steroid creams, there isn’t that much scientific research that supports one method over the other. A study published in 2012 examined the evidence of mosquito bite treatments and found there isn't a clear-cut winner. Doctors and other professionals provide their opinions (although expert opinions) instead of facts. Again everyone’s body will react differently to a mosquito’s bite and any treatments to reduce the itching. I do recommend trying an over-the-counter antihistamine or corticosteroid, but you should always consult your doctor before doing anything that involves your health. Aside from the solutions above, some other “non-traditional” methods have worked for people. Most of these methods are natural mosquito bite treatments you can use with products already in your house. You'll notice there are some crazy ways people go about getting rid of mosquito bites. From banana peels to hot spoons, it’s quite impressive the lengths some people will go. 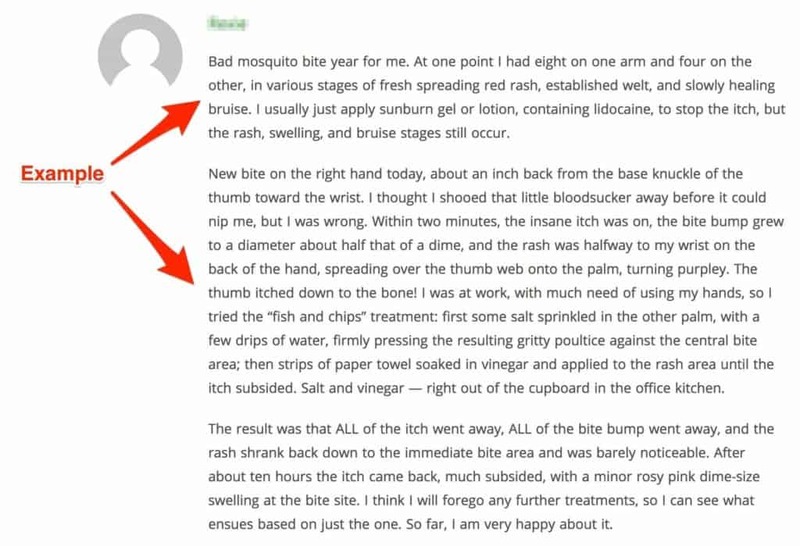 To help you out, I did some digging around the internet and listed many of the ways people have found success in ridding themselves of mosquito bites. Please note: These methods have not necessarily been tested scientifically or proven to be effective. Please use caution if you attempt any of the below ideas at home. Among it’s many uses, activated charcoal is great for mosquito bites as it absorbs the toxins out of your skin. If you want to learn more about the chemistry behind it all check out this article. People often apply aloe vera before and after exposing themselves to mosquito populations. It can deter mosquitoes from landing on you and help sooth your skin if they manage to bite you. If there's one solution you should try, it's apple cider vinegar. There are many successful accounts of apple cider vinegar being used to prevent and treat mosquito bites. Because of aspirin's anti-inflammatory properties, crushing up an aspirin tablet and mixing it with water has been seen to help with mosquito bites. One of the more "odd" ideas to help with mosquito includes rubbing the inside of the peel on the bite. The logic here is that banana peels have antioxidants, which help relieve the itch. This one should be no surprise given how many uses baking soda has. When applied to your skin, baking soda has been seen to reduce irritation and make mosquito bites more bearable. When you think of chapstick you usually think of dry skin. Some medicated formulations have been seen to help sooth mosquito bites. You can either eat garlic to rub garlic on your mosquito bite to help prevent mosquito bite itching. Dr. Edward from the Global Healing center recommends rubbing raw garlic on the bite. Studies have shown when you heat up a mosquito bite it starts to help reduce itching sensation relatively quickly. The same study also reports that heat can help with wasps, bees, and other bug bite stings. Many folks online, myself included, have found that meat tenderizer significantly helps reduce the itch from mosquito bites. Back in 2012, CNN reported﻿ similar findings that further validated that this could be a worthwhile solution. Courtesy of Reddit, this one is definitely in the strange category, but I thought it was worth adding because it just goes to show you how many various treatments have tried to get rid of their mosquito bites! Here's another one from Reddit. I've seen a number of people who swear by tea tree oil and the comments down below give you an example of its effectiveness. This is one I'm sure most of us have in our medicine cabinets right now.​ I know when I was growing up, my mother would always give me calamine lotion anytime I had gotten a sun burn to help ease the irritation. It makes sense that it's also widely recommended to help with mosquito bites! Another one you might not have heard of before is deodorant. For those of you who might be on the more sensitive side when it comes to mosquito bites, try out an antiperspirant. Honey has antimicrobial properties, which can help with reducing inflation and the allergic reactions. If you get bitten, take a cotton swab and rub a bit on the bite for instant relief. The acidic nature of certain condiments is capable of changing the pH level of your skin, which can help reduce the itching sensation. Similar to ketchup, and apple cider vinegar, lemons are also capable of changing the pH level on your skin to help with the mosquito bite itch. Just cut a slice and rub on the affected area. Lemon juice has also been seen to be an effective mosquito repellent. Another popular mosquito bite treatment is rubbing alcohol. In my experience, rubbing alcohol tends to dry your skin out rather than sooth it. Everyone's body will react differently so tread carefully. Dr. Leonard Perry notes that papaya could be a great way to get rid of mosquito bites. Papaya contains an enzyme "Papain" that breaks down the protein that mosquitos inject into a humans. Definitely worth a try. Ice has been one of the mainstays of medicine since the dawn of time. It makes sense that it would also be useful in reducing the swelling of mosquito bites and helping with the healing process. Another natural treatment would be peppermint or spearmint toothpaste. Menthol is found in peppermint or spearmint, whic﻿﻿h has a cool and relieving affect on the affected area. Definitely something worth checking out. I think we can all agree, mosquito bites aren't fun. Thankfully, there are a bunch of easy ways to help get rid of them. Have more ways to get rid of mosquito bites I haven't listed? Feel free to leave a comment down below! Curious about other mosquito related articles? Check out our other detailed guides to help you deal with your pest problems.